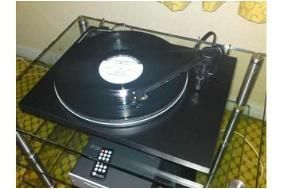 BRISTOL SHOW 2010: Pro-ject takes the wraps off its new £150 turntable | What Hi-Fi? And here it is: the £150 Essential turntable, with Pro-ject's own uni-pivot tonearm and Ortofon OM3E cartridge and stylus. It's released here at the Bristol Show and should be in the shops by March. If you want to hear it in action, pop along to rooms 408/409 here at the show.